These bears make wonderful heirlooms and gifts. You can personalise a name and/or date on one of the paws. A real gift of love and delightful way to mark that special occasion. 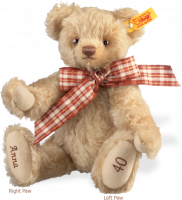 Each bear has the famous Steiff tag and button in the ear - the sign of a genuine Steiff.